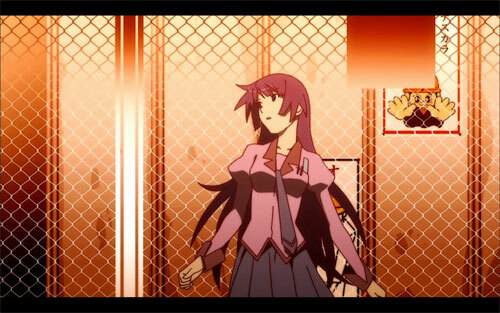 New anime out that is worth taking a look at called "Bakemonogatari". The title is a play on words of bakemono (monster) and monogatari (story). You could translate it simply as "Monster Story", but it's kind of like "Monstory" if the two words were able to remain intact when combined. The first episode was very good. Visually the show is beautiful. It reminds me a lot of Sayonara Zetsubou Sensei in the look of the characters, backgrounds, and the flashes of text used frequently, although the tone of the series is entirely different. It's edgy, disconcerting, and suspenseful. SZS may have also been edgy, but it was mostly comical and silly. I don't want to ruin anything about the first episode so I'll just say that you can be assured there will be some interesting use of monsters and myth from Japanese religion and folklore as well as more traditional supernatural elements. However the setting appears to be a very stylized modern-day high school setting.